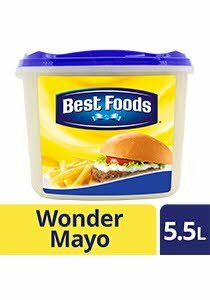 Ideal for sandwiches, dressings and dips. Water, Soybean Oil, Sugar, Vinegar, Modified Food Starch, Cornstarch, Eggs, Iodized Salt, Spices, Vegetable And Modified Gums, Preservatives (Sorbic And Potassium Sorbate), Food Acids (Phosphoric, Citric), Sweeteners (Aspartame, Acesulfame Potassium), Beta Carotene. Calcium Disodium Edta Added To Protect Flavor. Keep in a cool and dry place. Refrigerate after opening. Do not freeze.